Crewe midfielder Luke Murphy has signed a new two-year deal at the club. The 21-year-old academy graduate has made 66 appearances for the League Two side since his first-team debut in December 2008. This season he has been ever-present in Dario Gradi's side, scoring three goals in 21 appearances. Murphy told BBC Radio Stoke: "I'm delighted to have signed a new contract. I wouldn't want to be anywhere else." He added: "This was the last year of my contract so coming into this season, you never know what is going to happen. "But I knew if I just got my head down and concentrated on playing football and pulled a few performances out then Dario wouldn't hesitate to offer me a deal." Murphy has followed in the footsteps of fellow academy trainee Matt Tootle, who signed a one-year extension on Friday. 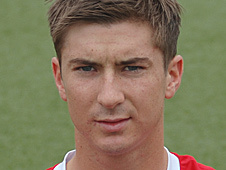 The 20-year-old full-back, who has made 46 appearances for the Alex in all competitions, has agreed to stay until 2014. Ashley Westwood, AJ Leitch Smith and Shaun Miller are also expected to sign new deals and Gradi confirmed that four academy scholars have been offered first-year professional deals.